Fourteen companies have signed up for a new programme launched last week to encourage Singaporeans to rejoin the workforce. The companies include the Singapore Recreation Club, printing firm Unique Press and education centre Cerebral. The programme, called WorkPro, will provide $170 million in funding for employers over the next three years. Speaking yesterday at an event aimed at getting women back to the workforce, Acting Manpower Minister Tan Chuan-Jin urged more employers to tap the various forms of support that WorkPro provides. He said: "WorkPro will help employers create more progressive and work-life friendly workplaces. This will make it easier for working women to strike a balance between work and family, as well as create more flexible jobs for women who want to return to work." Minister of State for Manpower, Dr Amy Khor, also speaking at the event, said many women leave the workforce to take care of their family but may want to return to work when their children are older or if there are flexi-work arrangements. Companies can tap WorkPro, first announced last month, to fund initiatives such as job redesign, on-the-job training and flexible work arrangements. At the Singapore Recreation Club, 68 out of 167 staff are above 50. Its general manager, Mr Abdul Rashid, said the club hopes to take advantage of WorkPro to improve productivity and working conditions, so it can continue relying on locals, given the tightening of the foreign labour supply. Mr Tan said the Workforce Development Agency (WDA) has appointed 12 ambassadors to promote WorkPro to those who are keen to return to work. Their role is to actively reach out to job seekers at district job fairs. 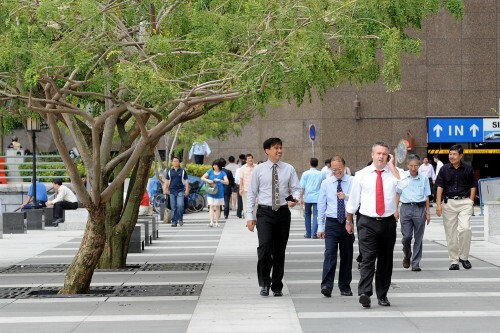 The first job fair will be held in the South West District in July. Together with the Women's Integration Network Council, the WDA plans to appoint 100 ambassadors by the middle of next year. Ms Sher-Li Torrey, 37, one of the ambassadors, founded social enterprise Mums@Work, in 2010, which helps women find a balance between being a mother and working. She said people who have stopped working for three to five years or longer - even those who held senior positions - tend to lose confidence in applying for jobs. She said: "I hope to reach out to women and tell employers that these women have a lot to offer."